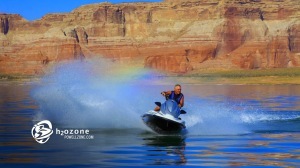 Get ready for a beautiful day of adventure on Lake Powell. With nearly 2,000 miles of shoreline to explore, there’s not a moment to lose. That’s why we provide everything you need to hit the lake and start riding. Our family has been in business for almost 20 years, so you know you’re in good hands. We’ll personally show you how to use your equipment, where to find the best routes, and how to maximize every moment of fun. All you need to do is enjoy your perfect day on the water. H2O Zone rents the largest selection of personal watercraft in the Lake Powell area. Choose from an exciting variety of Honda AquaTrax and Kawasaki models, all of which are inspected by our crew every day. And since our shop is just a short drive from the lake, we’ll get you fully outfitted before you go. Our team will set you up with a trailer, life jackets, and a training session on how to transport and launch your personal watercraft. You’ll be zooming across the lake in no time. There’s a reason our customers come back again and again: we treat you like a member of our family. Looking for ideas on where to go? Need some water safety tips? 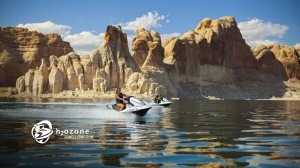 We’ve lived by Lake Powell since 1972, so we’ve got you covered. Still, even with our growing fleet and years of experience, we’re a family-run business that’s here to take care of you. We hope you’ll come back every year to share new adventures with us.